Wondering what to do with the kids at Easter? Why not take them rock pooling on one of the Isle of Wight's beaches and explore a whole new world in a tiny little pond left by the receding tide. I remember spending hours staring into rock pools as a kid, fascinated by all the little fishes and shrimps darting for cover under seaweed and rocks. I was lucky enough to relive that experience again last weekend when Ian Boyd, a local environmental conservationist, conducted a walk to Horse Ledge at Luccombe to take a look at the rock pools there. On the intertidal ledge, the pools looked void of animal life initially but we knew, with a little bit of patience and a closer look that those pools of sea water would be home to a whole host of species. 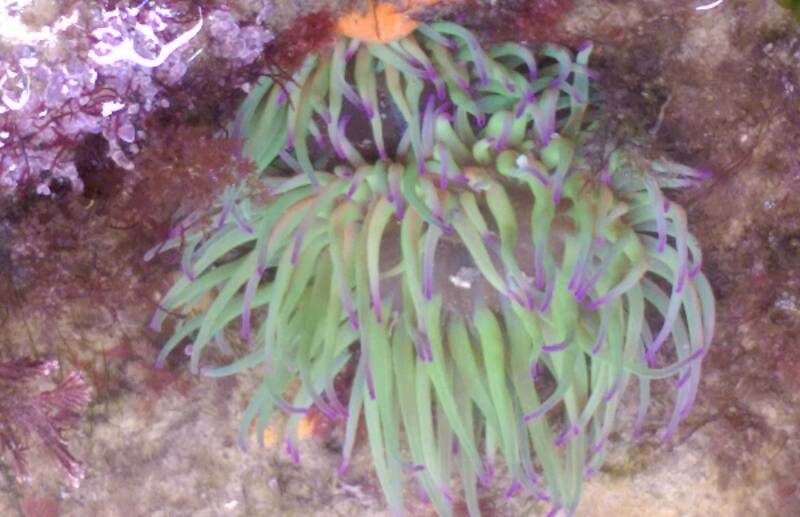 We first spotted one snakelocks anemone with green and purple tentacles. Then we saw a few more in other rock pools. Ian pointed out a daisy anemone and suddenly we saw loads. The more we looked, the more we saw and our eyes started to pick out the unusual things like open and closed strawberry anemones. 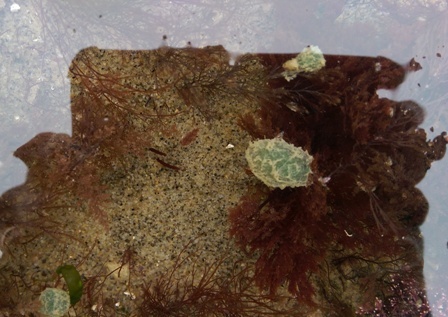 We also spotted a few green worm egg sacs – the first sign of spring according to marine biologists. 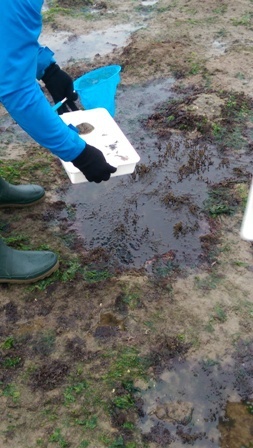 We carefully fished out some creatures with our fine mesh nets and put them in a tray with some water taken from a rock pool to have a closer look. 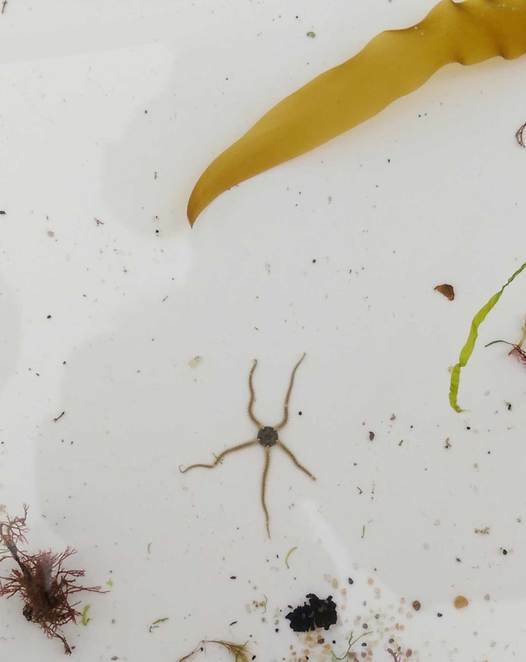 The white plastic was a good contrast to the wildlife and allowed young brittle stars, some baby sea kelp and a few different species of juvenile crabs to be observed in more detail. The rock pools are a vital and safe harbour for young sea life giving them a chance between the tides to find shelter from predators. 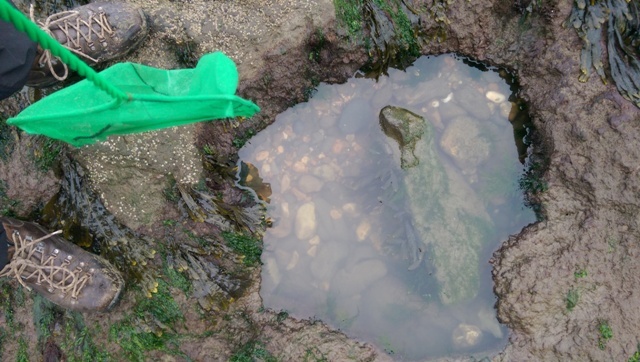 So we made sure that everything we removed from the rock pool was safely returned when we'd finished looking at them. 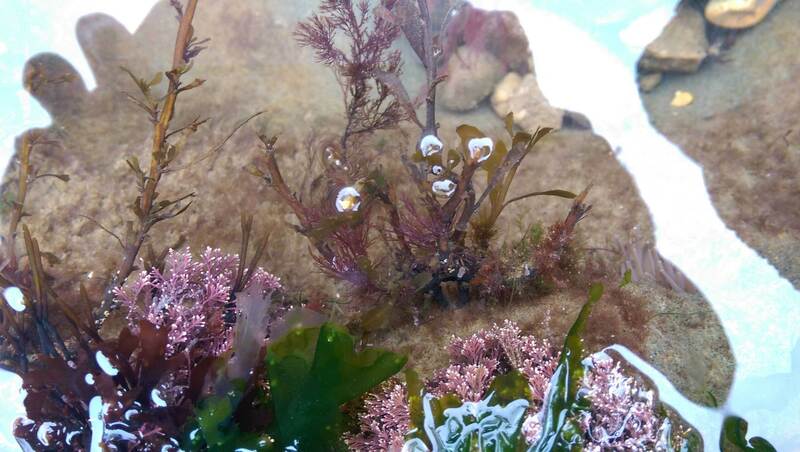 Most of the creatures we found at Horse Ledge could be found at other rock pools on the Isle of Wight and along the south coast of England but there was one thing that got everyone excited, including the experts. A starfish! 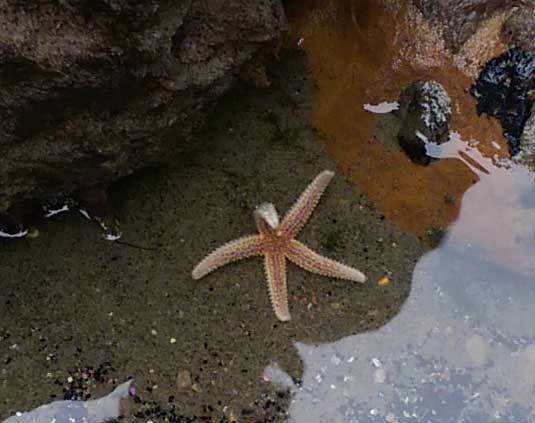 Although starfish are quite common in other parts of the country, they are a very unusual sight on the Isle of Wight and prompted everyone to get their camera out to snap a photo. What do you need to go Rock Pooling? Shoes with a good grip, walking boots or wellies are best. You may want to take a fine meshed net and a white container to examine any specimens you find in more detail but remember to put them back again when you're finished. Tread very carefully. Wet seaweed on the rocks is more slippery than ice and it will be a rather hard and painful landing if you come crashing down. Check the time of low tide– you don't want to get stranded. Keep away from the base of the cliffs – there are regular cliff falls on the Isle of Wight, so don't go rock pooling below the cliffs. Where can you go and what will you find? Culver at the pig troughs although it's a bit of a long hard walk from Yaverland car park, so probably not suitable for small children. An abundant variety of seaweeds and you may even see a starfish. I had such an interesting time rock pooling, that I plan to go back again in the next week or so to see if there are any changes. Why not rekindle that passion you had as a child and head out to your local beach with a bucket and net? Find out more about the Isle of Wight beaches here and the Usborne Spotter's Guide to the Seashore is a great book to help you identify your finds.